Keeping the winter cold out of horse barn. 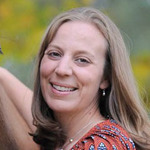 Summer can be a busy time of year for horse owners. Hauling horses to competitions or clinics, operating boarding facilities, summer camps, or lesson programs or simply providing daily care for horses at an owner's private barn during the sultry summer months can be exhausting. Horse owners welcome the cooler weather and often think of fall as a time to enjoy their horses at a more leisurely pace. Simple winter preparations will make your barn safer and more enjoyable for humans and horses alike. While fall is a time to fully enjoy horse ownership, it is also a time to prepare for inclement weather brought by winter. Barn-keeping strategies likely remain the same for owners in regions that do not experience freezing temperatures or storms, but for horse owners living in areas with winter weather, taking the time to prepare will be worth avoiding frustration down the road. Look for drafty areas. 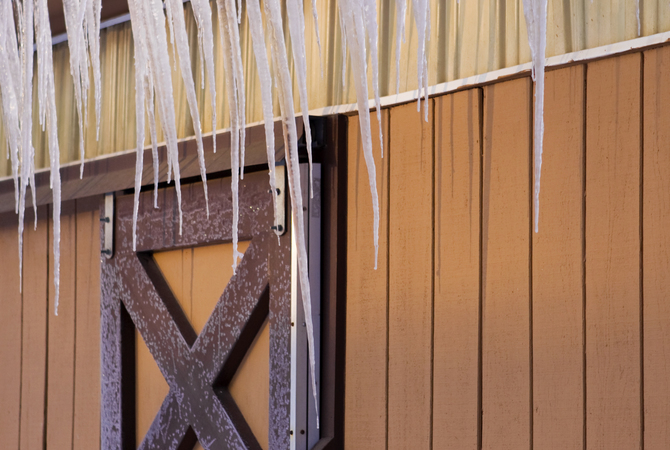 Check barn doors, barn windows, and other areas for large drafts. Cover holes that would allow in too much cold air. Eliminate drafty areas, but leave spaces for fresh air to circulate. Good ventilation is critical. 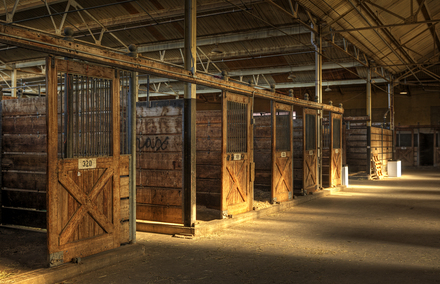 A barn that is "too tight" prevents any airflow from circulating and can lead to respiratory ailments. 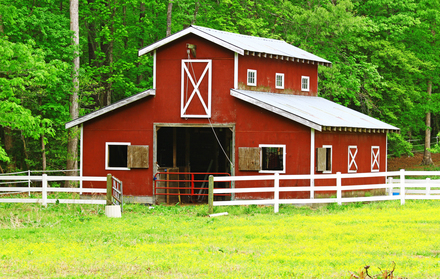 Give the mechanical structure of the interior of your barn a once-over before winter sets in. Insulate water hydrants and exposed pipes. 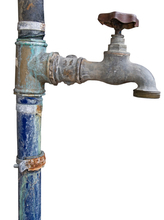 Insulating tape can be purchased at most local hardware stores and is an inexpensive way to avoid frozen water supplies. Tank heaters for outdoor water troughs are also available at local farm supply stores. Purchase a heater designed for livestock tanks. Some heaters are only designed to bring water to a boil. Plan ahead. Stock up on feed and supplements. 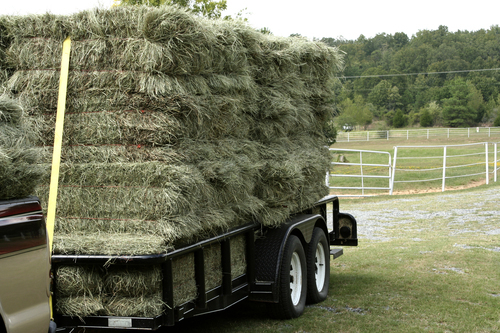 When inclement weather sets in, a trip to the feed store or hay supplier could be treacherous. Dangerous storms and icy roads can be avoided by filling your horse's hay barn when the weather is good. Horse owners in regions that experience regular storms may want to keep a two, three, or even four week supply on hand. Listen to weather forecasts regularly for alerts about upcoming storms. If severe weather is predicted, purchase needed supplies before the weather arrives. Prepare for rodents and pests. Rodents seek shelter from harsh weather conditions. Grain, hay, and horse supplements attract pests, especially in the winter. Purchase rodent-proof storage containers for feed and supplements and consider a pest control plan. Bait and traps should be used carefully, especially when cats also live in the barn. Taking the time to plan ahead before the winter weather arrives will save horse owners time and frustration. It is also important to remember that horse owners often think a horse is cold just because they themselves are cold. 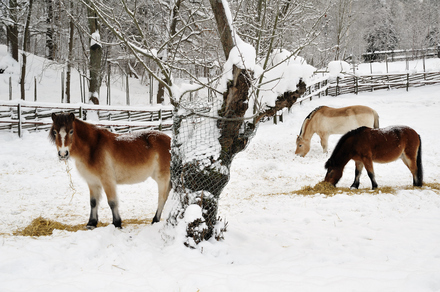 Horses that grow a winter coat have natural protection from the elements. Crisp winter mornings can be beautiful and a great time to enjoy that natural wonder of the horse. Wind and wet weather can penetrate a horse's thick coat, so a run-in or shelter is helpful. If the horse is blanketed, a clean, dry spare blanket should be on-hand to replace a wet, dirty, or damaged one. A good rule of thumb is that if a horse's ears are cold, the horse is cold. EquiMed wants you to have a safe and healthy barn. For more ideas on this topic, visit Health Barn Health Center.